In PAPER 60 has been stated: ‘The “body” of God’s Universe Supreme is in it-Self a giant macro-holographic vortex of purposeful energy of unified intelligent Self stemming from the Paradise center. The Universe and all of its Creations and Evolutions of time and space are therefore of the Intelligent Design and so are you as the solar micro-holographic vortex of actualizing Supreme’s time-space potentials. - Has up and down wobble gyrations. The rapid motions between the PUMA electric charge-polarities and the magnetic-mass of the PUMA wave-particles, seen as the PUMA vortex spin-pulsations and the expansion-contractions, represent the electric in/out-pulse action and magnetic expansion/contraction reactive interplay process of the evolving geo-magnetic, electro-magnetic and the electro-chemical physical universe. Schematic Male-Female PUMA vortex energy interactions are shown below in Picture 4 A-C.
in their electric and magnetic wave-particles interactions. One point of disagreement with Vogt and Sultan’s above statement is that in the interactions between the electro-magnetic wave-particles the initial electric impulse (in-pulse) phase always precedes the magnetic-matter expansion-contraction response. Electric in-pulse represents the qualitative/higher aspect (spirit active analog in live matter) while the magnetic reaction represents the quantitative/lower aspect (or matter re-active analog) in their action-reaction cosmic interplay. In the in-organic matter these E-M interferences generate the mechanical non-teachable matter consciousness/awareness, while in the organic living organisms their interferences generate the spirit teachable non-mechanical MIND (Memory INDuction). Through evolution many of these physical E-M action-reaction interferences have become automatic. The macro-examples in humans would be the left heart electric action in-pulse followed by the left ventricular blood in-filling response, hunger in-pulse followed by food in-take etc. “The spine is called in India the Brahmadanda, the stick of Brahma. The universe creation-evolution process is the process of sharing both ways by the holographic vortex interference Paradise patterns spiritual download and the evolutionary experiential life ascending mind upload. In this process the time-space universe life contributes to the actualization of the God Supreme and the God Supreme contributes back to its time-space universe life. This is a cyclical process of engagement and then release of the space energy through the holographic vortex interferences which continues throughout the entire actualization and ascension growth of the Supreme Being in Light and Life. The connecting dimension that is usually transparent but very real--called spirit—is the dimension that is tying everyone and everything together no matter how disparate or unknown to each other they are. The holographic vortex 1º causative action ripples and (-1º) re-active counter-ripples and 2º action ripples and (-2º) re-active counter-ripples etc. are all bouncing back and forth and influencing each other and only in the moments of stillness the observing subject can sense all these ripples bouncing around inside his/her mind--all a wonderful appreciation of the inter-connectedness and oneness (wholeness) of the universe life. With the formation of the Physical UltiMate Atomic (PUMA) vortices, their indwelling forces bring many of spin combinations of ultimate atoms into play mainly through their forces of attraction or repulsion within surrounding undifferentiated space forming walls of separation of each combination of sub-group or aggregate formed. PUMA vortex E-M expansions and contractions represent the pulse and breathing of its wave-particle within its environment. 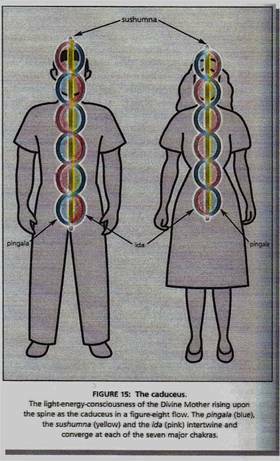 The PUMA vortex super-cell’s outer coil with its energy latitudes (parallels) and longitudes (meridians) flows represent the creature mater-realized “outer” energy body while the “inner” energy induction coil represents the vortex body matter-realized central or spinal energy column. Various electric and magnetic interferences between various PUMA wave-particles play role in the pre-mind evolution of the inorganic matter and the teachable mind evolution of the planetary organic life due to spirit (anti-gravity) and matter (gravity) interferences. These PUMA vortex electro-magnetic expansions and contractions represent the primordial IN- & OUT-PULSE and IN- & OUT-BREATH of PUMA wave-particles in the evolution of the inorganic matter mechanical non-teachable (pre-mind) consciousness as well as the spirit teachable mind 2º to the spirit-matter interferences in the evolving organic planetary life.